The 2015 season is here!! We already ran through the Conferences so now it's time to look at the big picture. Let's take a look at the conference winners, the final Top 25, the Playoff 4, the National Champs and the Award Winners. Ohio State beats Stanford to repeats as National Champions. Well there you have it. Everything you need to remember for the very end of the year. Let's check back in five months to see how accurate this is. I'm somewhat conflicted about the ACC because I see talent at a few teams and a 1980s legacy that is sorely out of date at others. There is no real threat to be in contention for the College Football Playoff here but there will be a few good games hopefully. 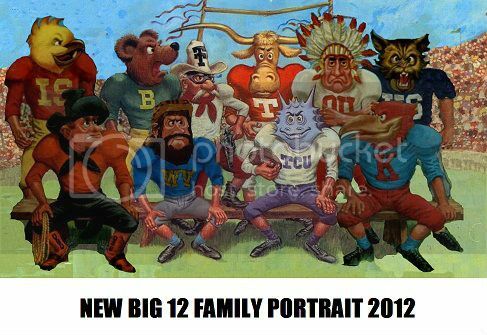 The Big 12 is probably the conference most eager to start the new season after getting shut out of the playoff last year despite two teams that would have been an easy choice to include. Outside of adding New Mexico and maybe Cincinnati, some MAC team, or North Dakota State they will stick with 10 teams for the foreseeable future and continue to struggle finding their One True Champion. The focus remains on TCU and Baylor as they've built very solid programs in the vacuum of Texas' recent implosion and Oklahoma's mysterious disappearance from national relevance. What happened? I think there will be some good teams but I don't think we'll see quite the same ridiculousness as we did last year when it seemed like every week there was a game that saw the underdog win in remarkable fashion. 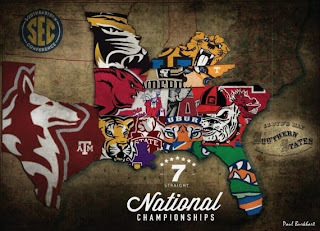 Continuing our coverage of the 2015 College Football conference breakdown we head down east to the the former best damn conference in the land with the SEC. While they haven't been winning championships like they used to the unimaginative pollsters haven't lost faith as the SEC is quite prevalent in this year's Top 25 polls. A full seven teams from the SEC appear in this year's Top 25 which calls into question the ability for anyone to make an accurate assessment of what teams are any good. By having so many teams in the Top 25, every game is automatically considered a quality win/loss and is thus a self fulfilling prophecy regardless of its' validity. This is exactly why I harp on the fact that college football would be more fun if there were more intra-conference FBS games. Conference games are cool but it's those matchups that get me excited. But let's talk about the SEC. They recruit lots of highly ranked guys and it shows in the players they put into the NFL so this is naturally a conference you should be paying attention to despite the fact that recently they just can't win the big one. Maybe next year? Based on those results I don't think you could say too much has changed. I've got Georgia beating Bama in the mid-season game but Bama won't lose to them twice as Saban and Co will secure another SEC championship this year. Time to pony up. It's been a while since posting but the dawn of a new day approaches and that day brings us Football. Sweet sweet regular season football. 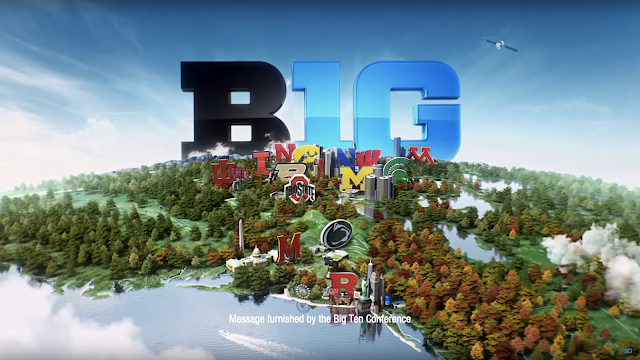 Here are my Big Ten predictions. The First Round is now wrapped up and in the books. With only 32 guys unavailable there is still a huge amount of talent out there and honestly Day 2 is probably the most exciting part of the draft to me because this is where teams can really separate themselves. So let's see how my picks stacked up against the real thing. Word of caution here: I would advise skimming this and never reading it or referencing it again. As you can see I knocked it out of the park. I would say that I wasn't super far off on a lot of these but mock drafting is a sport that takes an iron will and a terrible memory. In related news, I can't wait to get all 32 picks right again next year. With the draft just days away now, I thought it would be fun to elaborate on who I think the best players in this year's draft are. 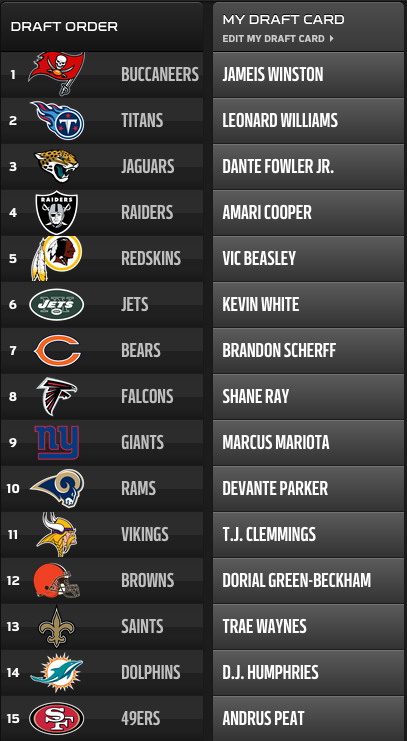 This is not where I think they'll be selected but where I think they stand with regard to NFL potential. This list goes to 100 because that's a nice clean number but also because that is about the upper limit of the number of players selected over the draft's first three rounds. That will do it for the SKOHRboard Top 100 NFL Draft Prospects. 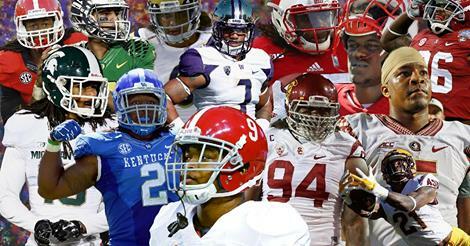 Hopefully your team can get a few guys from the list! Enjoy the festivities. The NFL draft is almost a week away and that means that it's time to see my predictive powers at work as correctly I lay out every single pick in the first round again for what will be the 5th consecutive year. Enjoy knowing now what those around you will have to wait until Thursday April 30th to find out. Thanks to NFL.com for the fancy layout and templating. That is something that in year's past has left our Operations team in tears. I also wanted to mention that it seems strange to me how little is made of Leonard Williams and Dante Fowler Jr. For being the 2nd and 3rd overall talents on most pundits draft boards there has been just about no general interest stories about those guys. What gives? The biggest surprise here was probably Mariota to the Giants. 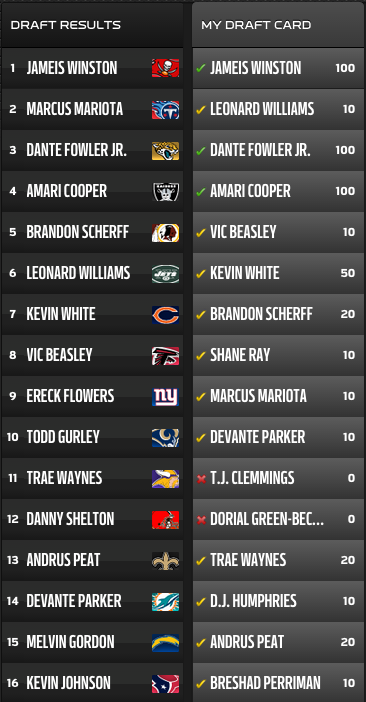 I was surprised when I looked at their team and who was out there and came up with Mariota. The Giants seem like a team that will bet on themselves improving, which means a worse draft selection and a smaller chance to select one of the top two QBs in a draft. Given Eli's marginal performance over the past few seasons, the end of his contract and what looks like it could be the end of Coughlin's reign should things go sideways, drafting Mariota would be a fairly clever way to point to the future and keep the band together for another few seasons. You're probably wondering why the Jets wouldn't take Mariota. I simply think that they aren't ready for a shiny new QB. If I were a first time head coach in my first year with a one time promising but now floundering third year QB I think I'd use my first draft to surround him with talent and give him another shot. If it doesn't work, you've now got a fairly talented roster and another high draft pick which you can use on a QB. While the Eagles don't really NEED a defensive end, I don't see Chip Kelly passing on Armstead who fits just about every physical trait we think Chip values in players and he's obviously well aware of the potential upside he brings to the table. Gordon to the Cardinals would be a lot of fun to see him combine with Ellington to give a rehabbed Palmer lots of options out of the backfield. 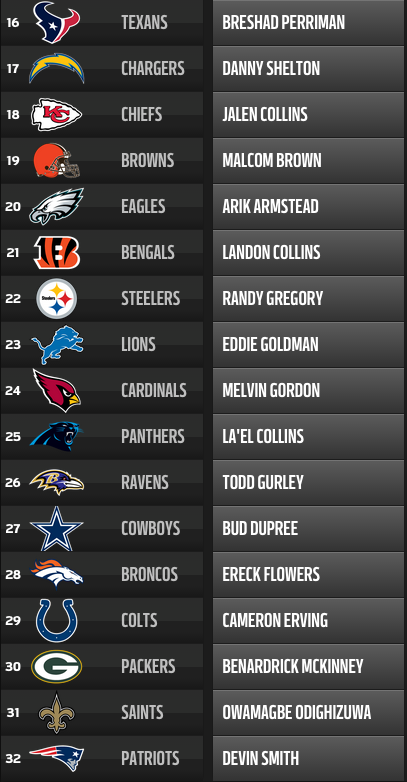 Todd Gurley to the Ravens seems like the most Ravens pick ever. 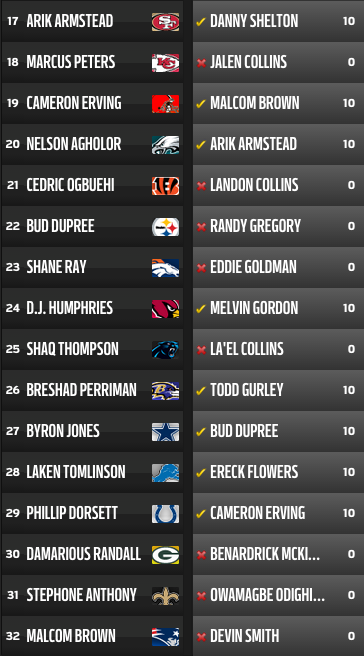 Somehow extremely talented players always seem to fall to the Ravens. Cameron Erving just seems to fit the bill with the Colts. He's a versatile lineman who can be a leader on that OL and learn a ton from Herremans and Luck after having spent the last few years with Winston at FSU. I'd really like to watch those two play together and lead the Colts into the next few years. Devin Smith is going to be a major asset to Tom Brady. He's a guy that is going to make Defensive Coordinators go nuts as his deep threat ability will put safeties trying to double Gronk in a no win situation as they'll have to balance that with covering him over the top. SKOHRboard's annual Mock Draft is coming! Who will the venerable sports wizards at SKOHRboard select for your team in this year's mock draft? Will they pick a future Hall of Famer, a serviceable starter, maybe a backup kicker!? Tune in as we get closer to April 28th to find out! It's Super Bowl Sunday! A fun day that will leave most football fans happy but wanting more. As an Eagles fan I'm usually left thinking about what could have been and about what if will take for next year. Today the two most dominant teams during a majority of the season the Patriots and the Seahawks both made it to the big game and they'll square off in Arizona. There are a number of things to watch out for in this game. Seattle's QB Russell Wilson has really come into his own this season and in my opinion is now firmly in the Top 5 QBs in the NFL. Not bad for a short kid who has only played three seasons. They do not have any elite WRs but they do have one of the best Offensive Lines in the game and that goes along with the best Rushing attack in the NFL as well. The Patriots Defense has their work cut out for them. 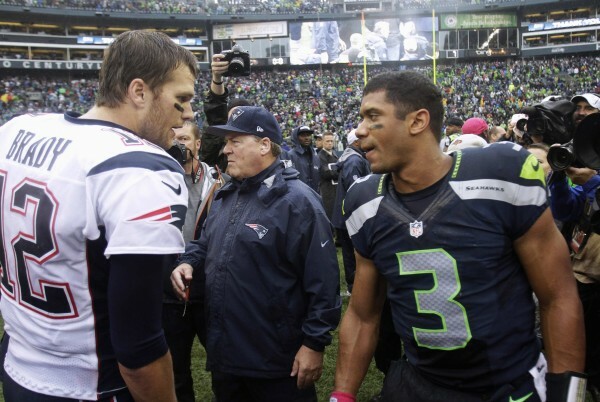 Some bad blood between the QBs after their last meeting when Wilson totally cheap shotted Brady. You can see the heated words and then Brady's retaliation. I'm sure you remember #SlapGate. The tension filled rematch should be fun to watch. The Patriots Defense is fortunate that they are chock full of Rutgers talent. With three Rutgers players (Logan Ryan, Duron Harmon, and Devin McCourty) starting on that side of the ball they can be sure that 27.3% of their defense is going to get the job done. It's the other 72.7% who are not Rutgers Alums that there are questions about. Players like Vince Wilfork and Jamie Collins will need to have rock solid games particularly in getting Seattle RB Marshawn Lynch on the ground when he is first hit rather than letting him bounce off and rumble for additional yards like he has so proficiently during most of the season. On the other side of the Ball is the matchup that everyone is excited about. It's Patriots QB Tom Brady and his rotating roster of rabble rousers competing with one of the best Defenses of the past decade. Patriots receivers to watch include Brandon LaFell, Julian Edelman, and Danny Amendola, not exactly murderers row out there but they get the job done. 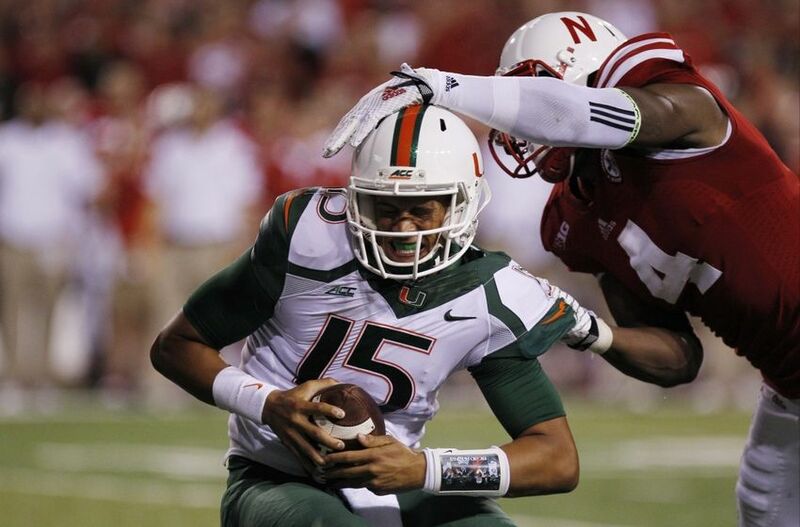 Their Tight Ends (Gronk and Rutgers Alum Tim Wright) are the real difference makers in this game. Noted force of NFL Nature Rob Gronkowski will be the key to this game. His matchup against the Seahawk D will decide the outcome here. 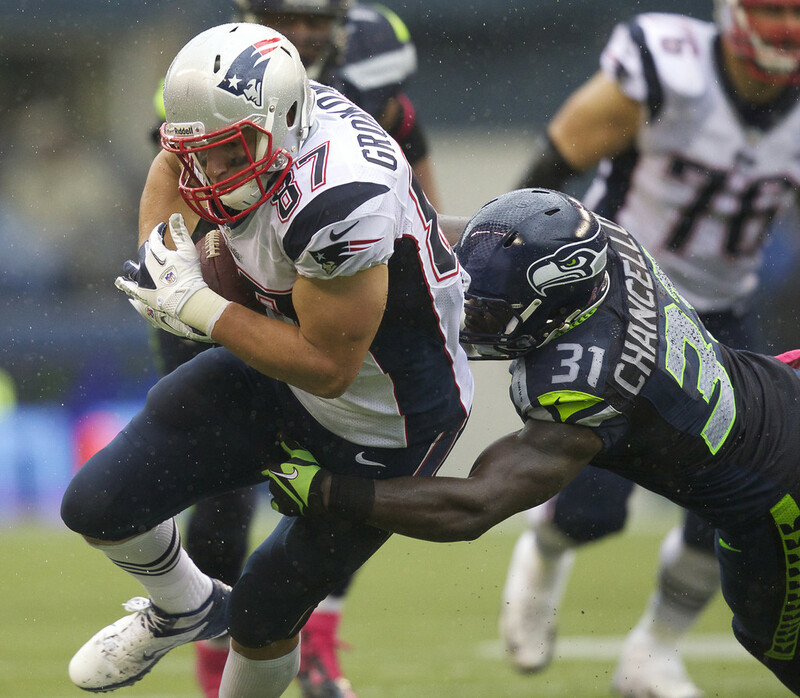 Can Kam Chancellor, Earl Thomas, KJ Wright, Bobby Wagner and the middle of the Seattle pass defense knock Gronk out of his rhythm and off balance enough to disrupt his impact? If they can I think it could be a very long day for the Patriots offense. 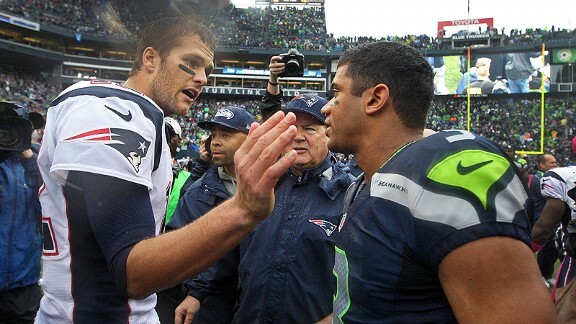 My feeling is at this point that the Seattle Defense will be able to slow down the Pats offense enough to get the win. The Seahawks offense is good but not spectacular but I think they are good enough to get points against a mediocre Pats Defense today. I'm sure Belichick will have a few tricks up his sleeve and this will be a memorably close Super Bowl but the Seahawks win 28-26.